Influencer marketing is booming with B2B and B2C brands big and small dipping their toes in the water. And it’s certainly not hard to see why. 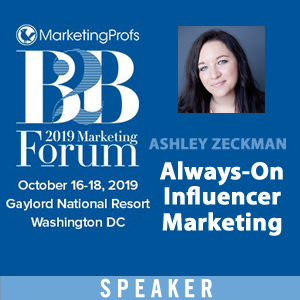 From declining consumer trust to content overload to near-dead organic reach on social channels, working with influencers enables brands to build credibility, authority with existing and new audiences, as well as connect with thoughtful industry experts. And, of course, partnering with influencers can help drive marketing results. In fact, according to a Linqia survey, 94% of marketers who use influencer marketing find it an effective practice that can generate up to 11-times the ROI of traditional advertising. But in order to keep your influencer partners interested, as well as drive results, thoughtful engagement is paramount. It’s all about building relationships — which is an art form, and an area where your sales team can be incredibly helpful. And I should know. I’m a recovering salesperson who’s now embedded in the influencer marketing world. Below I share seven sales-industry strategies and ideas that can be used to boost and inspire your influencer relations activities. #1 – Do your research. Any successful salesperson will tell you that sales is really about making friends. And you can’t make friends if you don’t know who you’re contacting. Sales teams are often well-versed in scouring and researching on LinkedIn and other online tools, looking for clues, connections and topics to discuss with their prospects or existing customers. When it comes to researching influencers you’d like to work with, that research and understanding is not only important to learn if they’re a good fit for your brand, but also the kind of topics they’re talking about, the people they follow and engage with, and even their personality. And all this can inform how you should with them before, during, and after the first time your work together. #2 – Use tools to save time and properly nurture. I know salespeople who have a big Excel spreadsheet they use to keep track of their prospects and contacts. But as their list grows, managing contacts and relationships becomes cumbersome and inefficient. That’s why most sales teams use a customer relationship management (CRM) tool to keep track of who their prospects and customers are, track their interactions and measure the likelihood the prospect will close. The same best practice should be applied to influencer relations and marketing. You need a tool or a set of tools to keep track of prospective and current influencer contacts. This will not only help you be efficient (and preserve your sanity), but also help you properly nurture the relationship through informed communication. Some of these helpful tools include Onalytica and Traackr. My advice, don’t go it alone. Use a tool. #3 – Social selling rocks. Nobody likes to be cold called. Eighty percent of decision makers won’t buy from a cold call and only 2% actually result in a meeting being scheduled. So, when I discovered social selling, I jumped in with both feet. I’d get to know my prospects on social media. Then, when I decided to reach out to them, they already knew me. It wasn’t a cold call, anymore. Getting to know your influencers works the same way. As touched on above, through social media, you can understand what they like to share, start to build a connection, and then interact with them before you make an ask. You can look at this as smart influencer engagement. 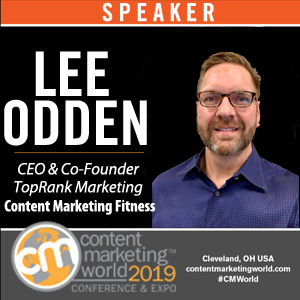 TopRank Marketing CEO Lee Odden calls this the “Confluence Romance,” a framework for making and maintaining influencer relationships. Did you know you can see a smile through the phone? It comes out in they way you write, too. I learned this in a sales class, and I’ve tested it. It really makes a difference if you smile through your interactions. People will be more likely to want to interact with you. And, don’t forget. Let your smile come through in all your interactions. More than ever, consumers and buyers want a personalized touch during their interactions with brands and salespeople — especially when it comes to email marketing, something that HubSpot spotlights in its article 18 Habits of Incredibly Successful Salespeople. Just as forward-thinking salespeople work to create a personalized experience for their customers and buyers, marketers should do the same when reaching out to influencers. It’s easy to send the same message to everyone you’re hoping to work with on a curated piece, larger asset, or ongoing campaign. But, a little personalization goes a long way. Consider mentioning a tweet or blog post you found interesting, or a previous conversation to show that you are not a bot. And, there are tools to help. You might consider a tool like Crystal Knows, which will help you understand the personality of your influencer prospect. Influencers expect and deserve a personal ask, so make the effort. Marketers, you’re selling your brand, the relationship, and the idea that working together will be mutually beneficial. You’re also trying to entice influencers take an action on a range of “offerings,” such as sharing a quote for an eBook or sharing something on social. You need to lead that influencer to an outcome that helps achieve your overall goal of solving a problem. How do you shape the close for an influencer? As I’ve mentioned a few times, look to create a mutually beneficial relationship. Consider the influencer may want to promote their book, spotlight their thought leadership or help the greater community. So, frame the close in a way that speaks to what they’ll get out of it. The hardest lesson a salesperson can learn is to accept “no” for answer. It’s a really hard lesson. After a “no,” the best think you can do is to access the sale process, and learn how you can do better the next time. Sometimes, influencers say “no,” too. You ask them to attend an event, but they may have a prior commitment. Or, maybe they don’t feel like the subject matter matches their expertise. When they say “no”, be gracious and ask follow-up questions to gain insight into why they made their decision. You might learn they have availability in two weeks, so your timing was just off. It is important to always be looking for the “next sale.” It is all a part of the process. At the end of the day, sales teams aren’t looking to close one-off deals. They’re looking to build long-term, mutually beneficial relationships with their customers. Marketers need to strive to do the same with influencers. It takes time and dedication, but it’s worth it for both you and your influencers. 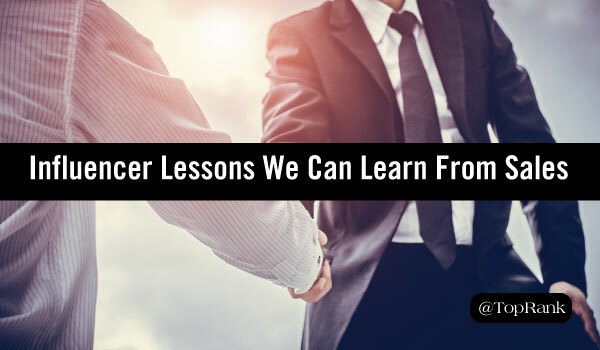 So, consider taking a cue from the land of sales to help you create a great relationships utilizing research, personalization, tools, social media, and a great attitude. You might find you’re getting fewer nos. Are you ready to go make some positive influencer interactions? You don’t need to go it alone. 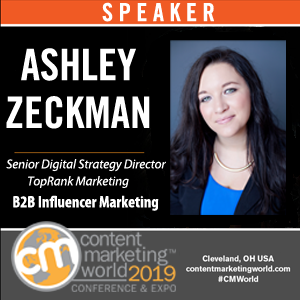 If you want help with an influencer marketing campaign, contact TopRank Marketing.